Are Your Email Templates Still Not Mobile-Friendly? There’s No Excuse! First of all just to recap the state of online marketing of the last years: most users now read email on their mobile, and most of these users will immediately delete an email that is not displayed right. If you create a mobile-friendly landing page for a campaign but don’t optimize your emails your hard work might be pointless. 1. You lack the expertise. In last couple of years email design and coding got more and more complex. The industry is shifting from basic HTML emails to sophisticated responsive email designs that appear properly on mobile devices is well. Responsive email coding is not a simple task and as someone with only basic knowledge in email marketing might think that it’s an impossible mission. But we are also experiencing a shift in creating emails. HTML coding is no longer necessary for you to create responsive email templates – an online email builder service will make your work so simple (especially with a drag-and-drop interface) that you’ll realize you don’t need special skills in coding at all. “2016 is the year coding emails becomes a thing of the past and email design becomes drop dead simple”, says Kraig Swensrud of Campaign Monitor and we agree. The solution: With an email editor like EDMdesigner you can be the king of responsive email design without knowing the first thing about complex coding. 2. You lack the resources. You might be short on budget, meaning you either don’t have the people, the time or simply the money to invest in email marketing. That is simply unacceptable if you are looking for a high return on your online marketing. According to the British Direct Marketing Association every single pound spent on email marketing returns £38. That is the highest ROI you can hope for! It means that whatever you spend on email campaigns will make you much more money than your actual spending. Also, a responsive email editor is not a huge investment at all: for any modern company it should be a drop in the bucket. A very valuable drop. It is no coincidence that 59% of marketers planned to increase their email marketing budget in 2015. The solution: Allocate your current resources. If you have no way you can increase you budget than make some hard decisions, because your competitors are investing big money in email. Also, it is not at all as expensive as you might think to have professional service: a responsive email builder will likely cost less than $100/month for your company. 3. You don’t know where to start. Should you create mobile-aware or responsive templates? What is the best approach, what will deliver the best results? The answer to this is that even if you create a quasi-mobile-aware template you are much better off than with a desktop-centric one. Decide what your goals are, who your target audience is and how much time and energy can you invest into creating your email templates and choose the right solution. Don’t be frightened of email editors. They are becoming dead simple, and totally affordable. For example we even offer a free package for single end users! The solution: Abandon the desktop-centric design and move towards responsive. Make your content at least mobile-aware, use bigger fonts, bigger buttons, make sure smart device users get the best user experience possible. Move with small steps if you have to, but keep moving. Do you really have reasons ­or just excuses? Not using mobile-friendly email templates is bad for you, because you are losing leads. In 2016 there is really no reason left why you shouldn’t use responsive email design. The tools are available to anyone, easy to use, and they are proven to be very profitable. 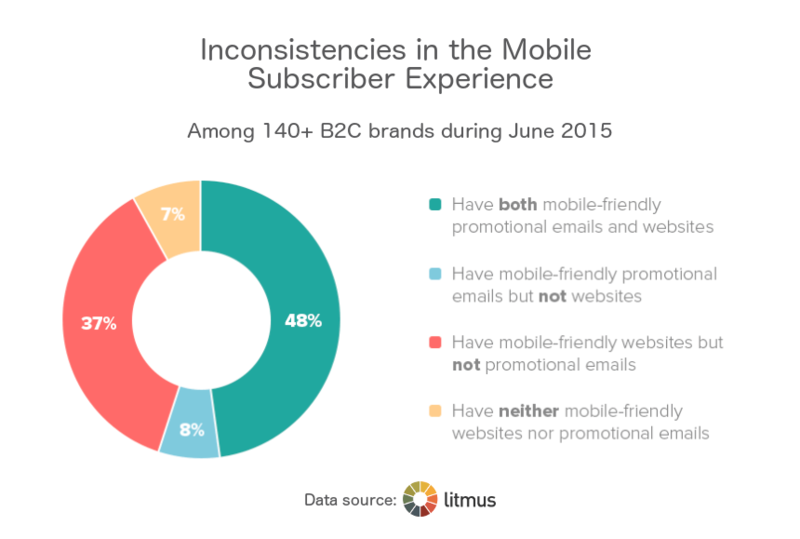 The one thing missing for the 37% who do not use mobile-friendly emails is commitment. The last 7% are dinosaurs… Don’t be one of them!